Why Choose Shriram Automall for Used Three-Wheeler? When you go out in the market to buy a used three-wheeler, what holds your purchase back is the risk that blows your head completely! But with Shriram Automall India Limited (SAMIL), people feel secured and confidently make the purchase. That’s because of complete transparency that goes into the making of a used three-wheeler’s successful deal at SAMIL. Through its multiple bidding platforms, Physical Bidding, Online Bidding, One Stop Classified Kiosk and Private Treaty, the Company offers the widest choice of used three-wheelers. From parking to disposal, every need of the customers is taken care of to serve a satisfying experience of acquiring and disposing a used three wheeler from SAMIL. The Company ensures complete organization in its varied bidding processes across all platforms and provides complete value-for-money transactions. Tip of the Day – How to hunt for a quality used car? Indians always prefer a drive on quality cars that suits their pocket. With budget being a major constraint with them, their dreams often restrict to a small aspiration and fail to meet the reality. But, sometimes dreams do become affordable and make way for their entry in a dreamer’s life. This happens when pre-owned cars come into the picture and the hunt begins for a quality used car. So, let’s take a look at a tip of the day that will help you get a better used car to drive. Get in touch with a source that you trust the most. Buying a used car can be a risky drive of your life. It’s not necessary that you’ll always get a good option. At times, you may also get worst option packed with the best of marketing tools. The deal will sound lucrative but you may end up getting caught in a trap. So, always look for a source that you can trust the most. You can also visit your nearest Shriram Automall, a one-stop marketplace for pre-owned cars and other types of used vehicles and equipment. The Company conducts exciting bidding events every month from where people can acquire and dispose their used vehicles. Auto companies have been raising vehicle prices, citing rising input costs. Why auto companies say that input costs have gone up when prices of most commodities seem to be coming down? OEMs have been absorbing increasing input costs in the past years which have been eating into their profit margins. The consumption of steel, aluminium, rubber, glass and plastic is high in the automotive industry. Raw material costs are less volatile as they are acquired under long-term agreements. Over a period of years, the number of components in the vehicles has also increased, which has resulted in higher consumption of raw materials. Strict government norms on safety, emissions and constantly changing technology have a significant impact on the supply chain cost. Stagnant sales, halt of excise sops and increasing inputs cost has made OEMs transfer a percentage of this cost to the end-consumer. Now the excise sops have gone. How will it affect car sales? When Shriram Automall came up with its One Stop Classified Kiosk, India perceived it like an ATM machine and assumed it only a box of money. Who could imagine that this small box could actually be a huge world of pre-owned vehicles and equipment? Well, only Shriram Automall could perceive this kind of box this way! Can we say that mankind has become even more lethargic in the era of e-commerce? Yes, we can! But, what’s wrong with that if we can get the same quality with less investment of time and money? Now that marketplaces have suddenly landed up in our home, we need to be extra cautious while making that perfect choice. So, what if you have to buy a used car online? Obviously, all of us need tips to make an appropriate purchase because it’s a virtual world that we are going to buy a used car from. Used cars online generally ride on the authenticity risk to reach your computer screen. Hence, it is your responsibility to verify the credibility of the seller. Your homework should be done well in advance of purchase. Well, a virtual test drive of a used car online is still going to take some more years of technological advancement. But, before that we have to depend on a real test drive only. So, get out of your lazy zone and go for a test drive before making that final purchase of a used car online. The world of the internet does not sleep at all. So, you have a time frame of 24X7 for any search. Use it as per your benefit and go for comparison spree. Compare all the used cars online with different dealers and finally make your decision as per the research. So, this small world of e-commerce ideally makes us smarter in our purchases. Yes, we are lazy, but we proudly transform that into a smarter purchasing power. 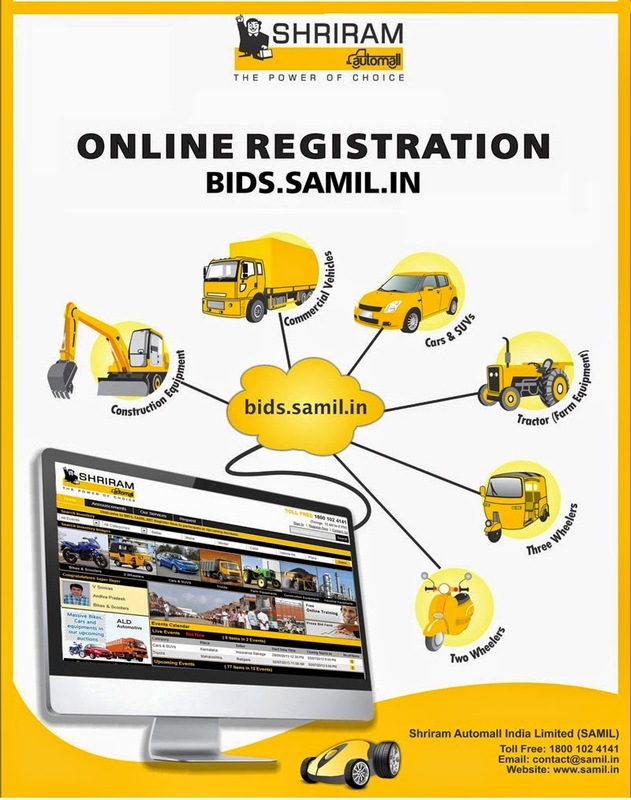 So, next time when you want to acquire used car online, visit http://bids.samil.in It’s an online web portal of Shriram Automall India Limited (SAMIL) with a huge variety of pre-owned cars and other vehicles to choose from. Mahindra Two Wheelers is one of the few manufacturers that entered the scooter market in India quite late. But now it is making sure that it remains competitive in the market and has also announced the development of a new 150cc scooter. This news was confirmed by Dharmendra Mishra, vice-president, MTWL, during the launch of the Gusto scooter in South India. For now, the top honcho has teased us with only this information and is tight-lipped about it details. But we can expect this 150cc scooter to be co-developed by Peugeot, Mahindra’s latest acquisition. Whenever you visit a Shriram Automall, you definitely come across this ATM-like machine called One Stop Classified Kiosk. So, does your foot stop in front of this Kiosk? Alright, let me give you 5 reasons to do that. This single machine carries detailed information on over 20,000 pre-owned vehicles and equipment from across India. So, be it any of your vehicle demand, we definitely have a solution for it in a One Stop Classified Kiosk. Once you get acquainted to this kiosk, you’ll definitely enjoy using it. Because, the search of your dream vehicle becomes quick and easy here! To get registered for a One Stop Classified Kiosk, all you need to do is pay Rs. 100. Isn’t quite a nominal fee to make your search interesting? Once you get registered, you get complete personal assistance in your search by a local representative at the Automall. So, next time when you visit a Shriram Automall, don’t forget to check out One Stop ClassifiedMachine - Making Search Easy!